As far as traffic congestion is concerned, Manila is sadly among the top 10 in the world – says the intro to this event’s video presentation. We guess that’s about right – given the traffic situation everyday. Fortunately, MMDA and TV5 are teaming up to help you beat that everyday stress of picking the wrong roads to drive on at the wrong time of the day by launching the MMDA / TV5 Traffic Navigator – a big-picture information website on the traffic situation along major thoroughfares in Metro Manila. Giving you up-to-date traffic details in one single, easy to read, on-demand webpage – so you’ll never find out which road you should have taken just a little too late. Since the Metro Manila Development Authority (MMDA) have been aggregating data that they update internally as part of their system of monitoring traffic on the Metro, TV5 and its website Interaksyon.com have decided to partner with them and push collate the traffic congestion data to an easy-to-read graphical representation. The system shows some of Manila’s major thoroughfares – including EDSA, C5, España, Quezon Avenue, SLEX, and more. All of these roads have multiple intersections monitored and have color-coded icons for both Northbound traffic and Southbound traffic. For example, you wanted to see if you could pass through EDSA southbound from Timog to Aurora Blvd., according to the screenshot above you’ll mostly be going through moderate traffic along the way. (Yellow) This should give motorists a great resource to check just before leaving home or work to see which roads lead to their destinations faster – without the need to wait for lengthy television broadcasts and/or listening for traffic information on the radio. Indeed, we’ve been using this service since it’s soft launch on June 29. Since we regularly travel around Manila to different destinations in different times of the day, we don’t have the luxury of having a regularly scheduled commute planned. Instead, we would check the Traffic Navigator website and see which roads were best to take at that exact moment. It has definitely saved us a lot of time in our commutes. New and current fans of this website should know that the Traffic Navigator can be viewed in pretty much any phone with a web browser. This should help all motorists check the traffic even if they don’t have access to their computers. What’s more, TV5 will be launching their iPad and iPhone app which will have the Interaksyon.com’s news as well as the traffic information. Official apps for other smartphone OSes should be coming soon – and you can download an unofficial Android one developed by a Mr. Michael Perez here. Finally, for a service that’s already pretty invaluable to our commute, it looks like things might still get better. Plans are underway to expand the coverage area to include roads like Commonwealth, Marcos Highway and Ortigas Avenue. 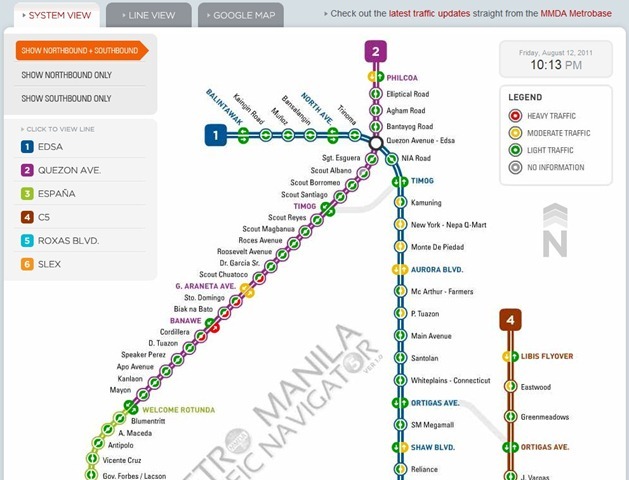 You can check out the MMDA / TV5 Traffic Navigator by going to mmdatraffic.interaksyon.com. We suggest you bookmark it right away.